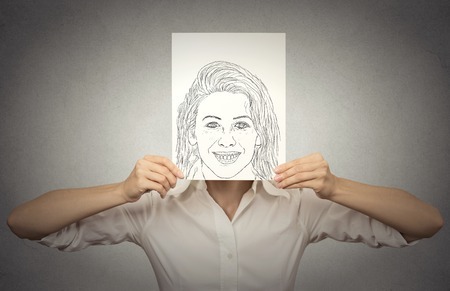 Is Your True Personality Reflected in Your Behavior? Recently a student reported, "I can abide by etiquette guidelines in public, but I'm not really so formal in my personal life!" The student may view etiquette as something like "putting on airs," or as formality not needed in personal life. When a person aims to be the best version of himself, he practices being courteous and respectful and is developing habits of making the consideration of others a number one priority regardless of the situation. When a willing student learns that there is something as simple as a great handshake, she can begin to be aware of what she's noticing when she shakes someone else's hand. She becomes mindful of the gestures of respectful greeting or honest farewell. A person can discover something about himself as he notices the difference in how others respond when he chooses a civil tone of voice and kind words that match his own intention of getting along with others. Being mindful of etiquette guidelines (wherever you are in the world) serves to make communication possible. Mannerly practices enable exchange of ideas and facilitate agreement on many levels. Aiming to know how to conduct yourself with colleagues at the office, as a parent at home, as a student at school, as a host entertaining guests at a fundraising dinner, and as a person with a different point of view, enhances one’s sense of self, of individuality, and certainly does not lessen it. Playing off Shakespeare's Polonius’ quote in “Hamlet” from long ago, "to thine own self be true," many a self-help author these days offer encouragement to "be you" and to "strive for authenticity." This does not mean letting up on your standards of being respectful and courteous to others, nor does it mean giving up your inclinations to be “your natural self.” Being natural doesn’t mean you give up on daily habits of brushing your teeth and combing your hair, or in performing other kindnesses such as opening doors for others and inviting someone else to go first -- small actions that make the everyday routines more pleasant even when there is work to be done and goals to accomplish. How a person conducts himself in everyday life is indicative of who he is. And though behavior doesn't necessarily fall into a "right" or "wrong" category, it will be read as who you are and what you stand for. "He demeans himself well who has self-respect. He behaves well who has respect to others." While conduct as an expression of your true personality is not always obvious to others, behavior is always observable. It is absolutely possible for the most self-respecting person you know to submit to a moment of emotional reactivity by yelling, cursing, or simply having a fit. One moment of human reaction isn't reflective of one's true personality even if the impression sticks in the minds of those who observed it. But if repeated over time, the person who conducts herself with habits of reactive behavior will be leaving more than just a bad impression. She will not be viewed as a person of integrity. Her reputation is authentically at stake! Where does etiquette fit into the aimed-for authentic self? Each person faces the problem of navigating and maintaining personal space within the collective sphere of shared space. 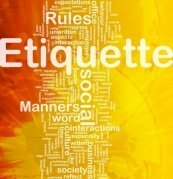 Etiquette can be considered as a body of “how-to” knowledge that is available to help you navigate gracefully in social situations. If practicing good etiquette is a claimed value every day, aiming to be the best version of yourself--even when you might be pulled in a thousand directions--becomes a habit. Being “etiquette-ful” puts you in the flow of what’s considered ‘proper’ and appropriate for the situation. You’re aiming to be natural, not artificial. Helping others to save face without creating a falsehood is a tactful behavior that can be learned. We're learners; that's natural. Seeing what a situation demands and remaining thoughtful of others while simultaneously respecting yourself, too, is what etiquette gives you the space to do. How? Because everything doesn’t need to be thought through. That’s the practical value of etiquette. You know that when you’re approaching a dinner table you should wait until the host signals you to sit, and that when you meet someone you extend your hand in greeting as a show of good faith. Knowing how and when to write thank you notes, how a meal progresses and when to help someone (or not) with her chair, are the little things that build comfort and confidence into the everyday. The little things of etiquette offer everyone present a sense of security, thus creating a civil structure around everyday activities socially and professionally. Etiquette, as with any showing of your true personality, is a choice. You are choosing how you fit, and the type of example you want to be in your social world.